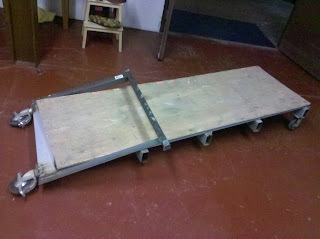 Welp, looks like the huge cart that we loaned out a few weeks ago has been found (stashed away downstairs) with broken wheels. If it's not operable before the market season, we're in for it... This reminds me of that kid who borrowed a pencil in elementary school and returned it with the eraser missing and chew marks all over it.